Considering the “Arctic Freeze”, “Polar Invasion”, “cold front that made me shiver in my Jockeys”, or whatever you decide to call it that just rolled in, I decided that a quick post on making a debris hut might be a good idea. 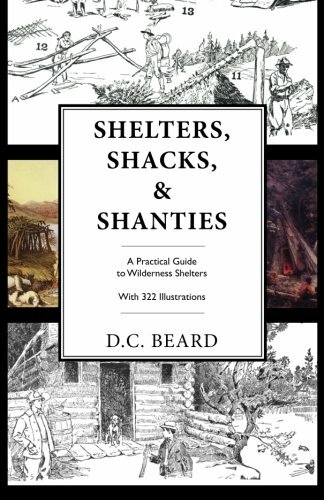 For those of you who do not know what a debris hut is, just think of a framed in structure with lots of leaves and branches over the top for insulation. 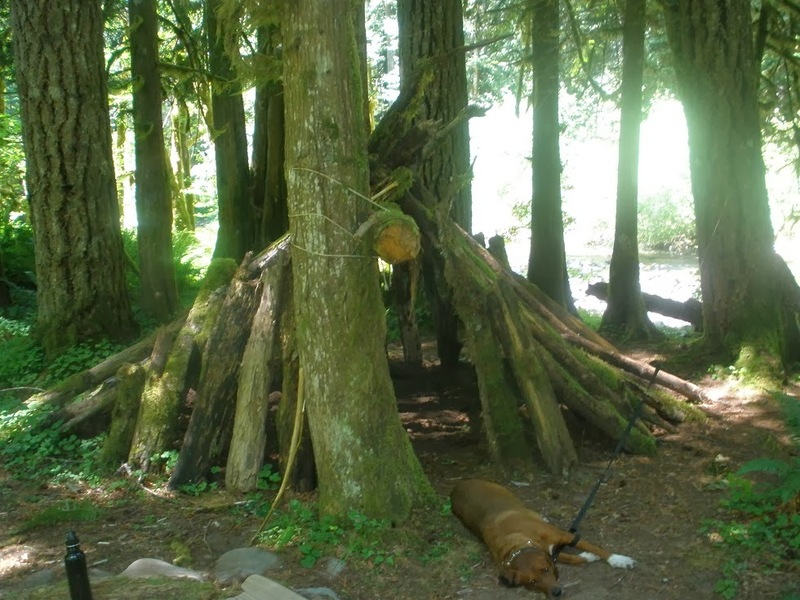 Here is the structure of one that we use when the bad weather comes in and we get stuck up in one of our camping areas. As you can see, my lazy hound likes it. I first found this structure while hiking up in the hills. Later on I found that this has been used quite extensively by several trail crews and hikers that get caught in bad weather. There are piles of downed boughs and debris from previous users of the hut not far off. During the summer months, however, it seems to be more used for people to put a tarp over one side while leaving the other side open for ventilation. Although this is not the best example of a debris hut, it does give you a real world picture of what these types structures can be used for as well as their versatility. Because I have never felt it necessary until now to have pictures of the building process, I am going to borrow a bit from the Internet. Here is a link to Wiki-How’s page on building them. I would like to toss out that the biggest reason that these type structures fail is due to a poor ridgepole and supporting structure. Many times I have found my friends scrambling to get out of their collapsed structures. Even though I find it humorous, they do not and in a real survival type situation this type thing could be bad. This video is done by a very skilled bushcrafter that I know from BushcraftUSA. There are dozens of these type videos out there, but considering I know him from the Internet I felt that his was the best to use. There are numerous variations of these type structures that are only hindered by your imagination. The important thing to remember is that you will need some strength to the frame and lots of insulation on top to ensure you don’t get cold/wet. I hope everyone found this post informative. If you want even more resources on woodman structures, I suggest you get this book. About any type structure you would want to build is covered in this book. It also goes over such necessities as heating and waterproofing. It is truly a great resource. 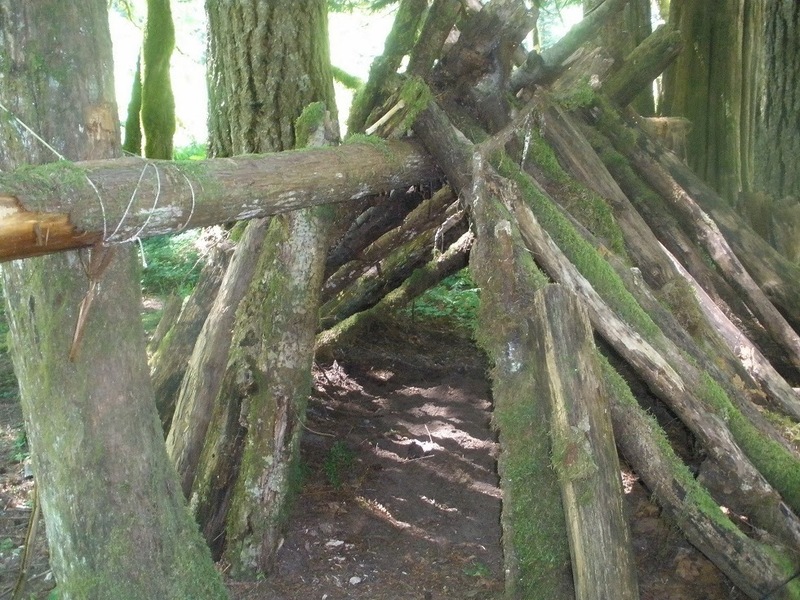 This entry was posted in Camp Techniques, Emergency Preps and tagged debris huts, emergency shelters, lean to shelters, leaning shelters, shelters, woodcraft shelters on November 14, 2014 by Woodsbum.